Population Ranked 15th in the U.S. The State of Indiana is the 19th U.S. state and is located in the midwestern region of the United States of America. With about 6.3 million residents, it is ranked 14th in population and 17th in population density. Indiana is ranked 38th in land area. Indiana is a diverse state with urban areas and smaller industrial cities. It is known for the Indianapolis 500 automobile race, held annually over the Memorial Day weekend, and a strong basketball tradition, often called Hoosier Hysteria. Residents of Indiana are called Hoosiers. Angel Mounds State Historical Site, one of the best preserved prehistoric Native American sites in the United States, can be found in southern Indiana near the city of Evansville. The state's name means "Land of the Indians." Ironically, after it became the nineteenth U.S. state in 1816, one of its first acts was to petition the federal government for removal of the Indians. 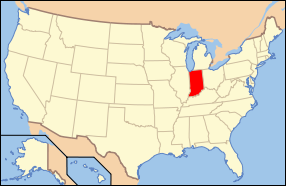 Indiana is bounded on the north by Lake Michigan and the state of Michigan; on the east by Ohio; on the south by Kentucky, sharing the Ohio River as their border; and on the west by Illinois. Indiana is one of the Great Lakes states. The northern boundary of the states of Ohio, Indiana, and Illinois was originally defined to be a latitudinal line drawn through the southernmost tip of Lake Michigan. Since such a line would not provide Indiana with usable frontage on the lake, its northern border was shifted ten miles north. The northern borders of Ohio and Illinois were also shifted from this original plan. The 475 mile (764 km) long Wabash River bisects the state from northeast to southwest and has given Indiana several theme songs, On the Banks of the Wabash, The Wabash Cannonball and Back Home Again, In Indiana. The White River (a tributary of the Wabash, a tributary of the Ohio) zigzags through central Indiana. The northwest corner of the state is part of the Chicago metropolitan area and has nearly one million residents. Gary and the cities and towns that make up the northern half of Lake, Porter, and La Porte Counties bordering on Lake Michigan, are effectively commuter suburbs of Chicago. Porter and Lake counties are commonly referred to as the Calumet Region. They are all in the Central Time Zone along with Chicago. Northern Indiana Commuter Transportation District NICTD owns and operates the South Shore Line, a commuter rail line that runs electric-powered trains between South Bend and Chicago. Sand dunes and heavy industry share the shoreline of Lake Michigan in northern Indiana. The South Bend metropolitan area in north central Indiana is the center of commerce in the region better known as Michiana, reflecting the interconnectedness with neighboring Michigan. Fort Wayne, the state's second largest city, is located in the northeastern part of the state. Northern Indiana is the site of one of the great ecological regions in the world—the Indian Dunes—a massive complex of living dunes at the southern end of Lake Michigan. The Dunes are a relic ecosystem providing habitat for many rare species of plants. The Kankakee River, which winds through northern Indiana, roughly demarcates suburban northwest Indiana from the rest of the state. The state capital, Indianapolis, is in the center of the state. It is the intersection of many interstate and US highways that gives the state its motto of "The Crossroads of America." 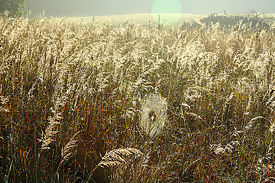 Rural areas in the central portion of the state are typically composed of a patchwork of fields and forested areas. Evansville, the third largest city in Indiana, is located in the southwestern corner of the state. It is located in a tri-state area that includes Illinois, Indiana, and Kentucky. The southeastern cities of Clarksville, Jeffersonville, and New Albany are part of the Louisville metropolitan area. Southern Indiana is a mixture of farmland and forest. The Hoosier National Forest is a 200,000 acre (80,900 ha) nature preserve in south central Indiana. Southern Indiana's topography is more varied than that in the north and generally contains more hills and geographic variation than the northern portion, such as the "Knobs," a series of 1,000 ft. hills that run parallel to the Ohio River in south-central Indiana. Brown County is well-known for its hills covered with colorful autumn foliage in the fall, the poet T.S. Eliot's former home, and Nashville, the county seat and shopping destination. The limestone geology of Southern Indiana has created numerous caves and one of the largest limestone quarry regions in the USA. Many of Indiana's official buildings, such as the state capitol building, the downtown monuments, the Indiana University School of Law in Indianapolis, and the Indiana Government Center are all examples of Indiana architecture made with the state's limestone. Most of Indiana has a humid continental climate, with hot, humid summers and cool to cold winters. The extreme southern portions of the state border on a humid subtropical climate with somewhat milder winters. Summertime maximum temperatures average around 85 °F (29 °C) with cooler nights around 60 °F (16 °C). Winters are a little more variable, but generally cool to cold temperatures. Most of Indiana averages above freezing, even in the coldest part of winter, except for the most northern edge of the state; the minimum temperature is below 20 °F (-8 °C) for most of the state. The state receives 40 inches (1,000 mm) of precipitation annually statewide, in all four seasons, with March through August being slightly wetter. The state does have its share of severe weather, both winter storms and thunderstorms. While generally not receiving as much snow as some states farther north, the state does have occasional blizzards, some due to lake effect snow. The state averages around 40 to 50 days with thunderstorms per year, with March and April seeing the most severe storms. While not considered part of Tornado Alley, Indiana is the Great Lakes state most likely to experience tornado activity: Three of the most severe tornadoes in US history affected Indiana; the Tri-State Tornado of 1925, the Palm Sunday tornado outbreak of 1965, and the Super Outbreak of 1974. The Evansville Tornado of November 2005 killed 25 people. 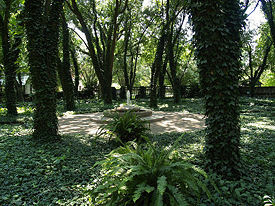 The area now known as Indiana has been settled since before the development of the Hopewell culture (ca. 100–400 C.E.). It was part of the Mississippian culture from roughly the year 1000 up to 1400. Remains of the state's earliest known inhabitants have been unearthed at an archaeological site on the Ohio River near the modern-day city of Evansville, known as Angel Mounds. Angel Mounds is one of the best preserved prehistoric Native American sites in the United States. Algonquian tribes, primarily the Miami and the Shawnee, fought to protect the lands from the Iroquois as they moved west from New York. The Potawatomi and the Delaware also lived in what is now Indiana. The Saint Joseph River was a means of transport for the French fur traders, connecting Canada and Louisiana. Settlers from the south and east began settling along the Ohio and Wabash Rivers. The French viewed this as a potential threat and subsequently built three forts; Fort-Miami (1704); Fort-Ouiatanon (1719); and Fort-Vincennes (1732). The area was claimed for New France in the 1763 and ceded to Great Britain as part of the settlement of the French and Indian Wars, forbidding further white settlement. In 1774 Parliament annexed the lands to Quebec. Native peoples and whites continued to engage in battle until 1794, when General Anthony Wayne defeated the Indians in a battle near Fallen Timbers. Indian resistance continued for several more decades as white settlement expanded, claiming more and more of the native hunting and fishing lands. The last major encounter was the Battle of Tippecanoe, led by General William Henry Harrison. The area became part of the U.S. territory following the American Revolution. Soon after, it became part of the Northwest Territory, then the Indiana Territory, and joined the Union in 1816 as the 19th state. Immediately following this, Indiana petitioned the federal government for the removal of Native Americans. In 1817 the individual tribes began ceding their remaining lands in exchange for reservations in Oklahoma and Kansas. This began with the Shawnee, Delaware and Wyandot. Soon, the Kickapoo, Piankashaw and Wea were forcibly removed, followed by the Potawatomi, who were forced to march to Kansas in midwinter, via the "Trail of Death." Indiana was re-settled from the Ohio River northward. Migration, mostly from Kentucky and Ohio, was so rapid that by 1820 the population was 147,176. By 1830, the sales of public lands reached 3,588,000 acres (5,600 sq mi; 14,500 km²); the population was 343,031 more than doubling in a decade. The first state capital was in the southern Indiana city of Corydon. The Mississippi River and its tributaries (the Ohio and Wabash) were the primary outlet for the increasing bounty of the Middle West. Access to navigable water was essential to economic development because there were few roads suitable for heavy transport in the early to mid-1800s. Since the costs of shipping goods to and from the east were almost prohibitive, Indiana advocated for and invested in canal building. In 1826, Congress granted land abutting the proposed Wabash and Erie Canal. Work began on the Wabash and Erie Canal in 1832, on the Whitewater Canal in 1836, on the Central in 1837. The Wabash and Erie Canal was built from Toledo to Evansville over several decades, finally completed in 1870. Upon completion, the canal actually increased prices of farm products three or fourfold and reduced prices of household needs 60 percent, a tremendous stimulus to agricultural development. By 1840, the population of the upper Wabash Valley had increased from 12,000 to 270,000. The canal boats that hauled grain east came back loaded with immigrants. In 1846, it is estimated that over thirty families settled in the state every day. Manufacturing also developed rapidly. In the ten years between 1840 and 1850, the counties bordering the canal had a population increase of 397 percent; those more fertile, but more remote counties had increases of 190 percent. The canal also brought emigration from Ohio, New York, and New England, in the newly established counties in the northern two-thirds of the state. Foreign immigration was mostly from Ireland and Germany. Later, the Wabash and Erie Canal was eventually abandoned, as railway mileage increased. By 1840, 9,122,688 acres (14,250 mi² or 36,918 km²) of the public domain had been sold. Despite rapid growth, the state was still deeply in debt. In 1851, a new constitution (still in force) was adopted. The first constitution was adopted at a convention assembled at Corydon, which had been the seat of government since December, 1813. The original statehouse, built of blue limestone, still stands; but in 1821, the site of the present capital, Indianapolis, was selected by the legislature. The railroad arrived in 1847; by 1910, it was a city of 225,000 inhabitants, and the largest inland steam and electric railroad center in the United States not located on a navigable waterway. State motto: Crossroads of America. State poem: Indiana, by Arthur Franklin Mapes. Indianapolis is the capital city of Indiana, and the county seat of Marion County. With a population of 781,870, it is Indiana's most populous city and is the 13th largest city in the U.S., the third largest city in the Midwest, and the second most populous Capital in the U.S., behind Phoenix, Arizona. Indianapolis is famous as the home of the Indianapolis Motor Speedway which hosts the annual Indy 500. The Indy 500 is the largest single-day sporting event in the world, hosting more than 257,000 permanent seats. Indiana's government has three branches: executive, legislative and judicial. The governor, elected for a four-year term, heads the executive branch. The General Assembly, the legislative branch, consists of the Senate and the House of Representatives. Indiana's fifty State Senators are elected for four-year terms and one hundred State Representatives for two-year terms. In odd-numbered years, the General Assembly meets in a sixty-one day session. In even-numbered years, the Assembly meets for thirty session days. The judicial branch consists of the Indiana Supreme Court, Court of Appeals, the Indiana Tax Court, and local circuit courts. Since 1964, when Indiana supported Democrat Lyndon B. Johnson over Republican Barry Goldwater, Indiana has favored the Republican candidate in federal elections. Nonetheless, half of Indiana's governors in the 20th century were Democrats. Indiana's delegation to the United States House of Representatives has not trended to either party's dominance. Democrats held the majority of seats until the 1994 Republican Revolution, when Republicans took a majority. This continued until 2006, when three Republican congressmen were defeated in Indiana, giving the Democrats a majority of the delegation again. Indiana was formerly home to two major military installations, Grissom Air Force Base near Peru (reduced to reservist operations in 1994) and Fort Benjamin Harrison near Indianapolis, now closed, though the Department of Defense continues to operate a large finance center there. Current active installations include Air National Guard fighter units at Fort Wayne, and Terre Haute airports (to be consolidated at Fort Wayne under the 2005 BRAC proposal, with the Terre Haute facility remaining open as a non-flying installation). The Army National Guard conducts operations at Camp Atterbury in Edinburgh, Indiana and helicopter operations out of Shelbyville Airport. The Crane Naval Weapons Center is in the southwest of the state and the Army's Newport Chemical Depot, which is currently heavily involved in neutralizing dangerous chemical weapons stored there, is in the western part of the state. The total gross state product in 2005 was US$214 billion in 2000 chained dollars. Indiana's per capita income, as of 2005, was US$31,150. The Calumet region of northwest Indiana is the largest steel producing area in the U.S. Steelmaking itself requires generating very large amounts of electric power. Indiana's other manufactures include pharmaceuticals and medical devices, automobiles, electrical equipment, transportation equipment, chemical products, rubber, petroleum and coal products, and factory machinery. Despite its reliance on manufacturing, Indiana has been much less affected by declines in traditional Rust Belt manufactures than many of its neighbors. In part, Indiana's economy is considered to be one of the most business-friendly in the U.S. This is due in part to its conservative business climate, low business taxes, relatively low union membership, and labor laws. The doctrine of at-will employment, whereby an employer can terminate an employee for any or no reason, is in force. Also, Indiana's labor force is located primarily in medium-sized and smaller cities rather than in very large and expensive metropolises. This makes it possible for firms to offer somewhat lower wages for these skills than would normally be paid. In other words, firms often see in Indiana a chance to obtain higher than average skills at lower than average wages. Indiana is home to the international headquarters of pharmaceutical company Eli Lilly in Indianapolis as well as the headquarters of Mead Johnson Nutritionals, a division of Bristol-Myers Squibb, in Evansville. Elkhart, in the north, has also had a strong economic base of pharmaceuticals, though this has changed over the past decade with the closure of Whitehall Laboratories in the 1990s and the planned drawdown of the large Bayer complex. Overall, Indiana ranks fifth among all U.S. states in total sales and shipments of pharmaceutical products and second highest in the number of biopharmaceutical related jobs. The state is located within the Corn Belt. 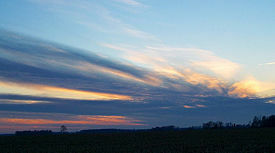 Corn, and its by-products, and feedlots to finish hogs and cattle are a major sector in Indiana's agricultural output. Soybeans are also a major cash crop. Its proximity to large urban centers, such as Chicago, assuring markets for dairies, egg production, and specialty agriculture including melons, tomatoes, grapes, and mint. Most of the original land was not prairie and had to be cleared of deciduous trees. Many parcels of woodland remain and support a furniture-making sector in the southern portion of the state. In mining, Indiana is probably best known for its decorative limestone from the southern, hilly portion of the state, especially from Lawrence County (the home area of Apollo I astronaut Gus Grissom). One of the many public buildings faced with this stone is The Pentagon, and after the September 11, 2001 attacks, a special effort was made by the mining industry of Indiana to replace those damaged walls with as nearly identical type and cut of material as the original facing. There are also large coal mines in the southern portion of the state. Like most Great Lakes states, Indiana has small to medium operating petroleum fields; the principal location of these today is in the extreme southwest, though operational oil derricks can be seen on the outskirts of Terre Haute. There are over 680 airport facilities in the state. Indianapolis International Airport serves the greater Indianapolis area. Other major airports include Evansville Regional Airport, Fort Wayne International Airport (which houses the 122nd Fighter Wing of the Air National Guard), and South Bend Regional Airport. The southern part of the state is also served by the Louisville International Airport across the Ohio River in Louisville, Kentucky. Indiana has over 4,255 railroad route miles, of which 91 percent are operated by Class I railroads, principally CSX Transportation and Norfolk Southern. Other Class I railroads in Indiana include Canadian National and the Soo Line, a Canadian Pacific Railway subsidiary, as well as Amtrak. The remaining miles are operated by 37 regional, local, and switching & terminal railroads. The South Shore Line is a busy notable commuter rail system extending from Chicago to South Bend. Indiana is currently implementing an extensive rail plan that was prepared in 2002 by the Parsons Corporation. Indiana ships over 70 million tons of cargo by water each year, ranking 14th among all US states. More than half of Indiana's border is water, which includes 400 miles of direct access to two major freight transportation arteries: the Great Lakes/St. Lawrence Seaway (via Lake Michigan) and the Inland Waterway System (via the Ohio River). The Ports of Indiana manages three major ports which include Burns Harbor, Jeffersonville, and Mount Vernon. Indiana has 10 different interstate highways, more than any other state in the U.S. This system includes 11,000 total highway miles. The number of intersecting highways in and around Indianapolis earned it the nickname as the "Crossroads of America." As of 2006, Indiana had an estimated population of 6,313,520, which is an increase of 47,501, or 0.8 percent, from the prior year and an increase of 233,003, or 3.8 percent, since the year 2000. This includes a natural increase since the last census of 196,728 people (that is 541,506 births minus 344,778 deaths) and an increase due to net migration of 51,117 people into the state. Immigration from outside the United States resulted in a net increase of 68,935 people, and migration within the country produced a net loss of 17,818 people. 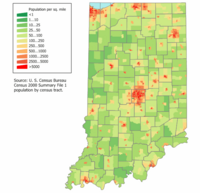 The center of population of Indiana is located in Hamilton County, in the town of Sheridan. Population growth since 1990 has been concentrated in the counties surrounding Indianapolis, with four of the top five fastest-growing counties in that area: Hamilton, Hendricks, Johnson, and Hancock. The other county is Dearborn County, which is near Cincinnati. As of 2005, the total population included 242,281 foreign-born (3.9 percent). German is the largest ancestry reported in Indiana, with 22.7 percent of the population reporting that ancestry in the Census. Persons citing "American" (12.0 percent) and English ancestry (8.9 percent) are also numerous, as are Irish (10.8 percent) and Polish (3.0 percent). The Indiana Department of Education contains a Division of Service Learning known as Action Without Borders, which utilizes the performance of service as means of education. In addition to regular classroom work, this program helps students from kindergarten through Grade 12 meet community needs, while improving their academic skills and learning the habits of good citizenship. Indiana's colleges and universities attract the fourth largest number of out-of-state students in the nation and the largest out-of-state student population in the midwest. In addition, Indiana ranks third in the country for keeping high school seniors in-state as Indiana colleges and universities attract 88 percent of Indiana's college attendees. Indiana universities also lead the nation in the attraction of international students with Purdue University and Indiana University ranked #3 and #17 respectively in the total international student enrollment of all universities in the United States. This exceptional popularity is attributed to the high quality of the research and educational universities located in the state. The state's leading higher education institutions include Indiana University, Rose-Hulman Institute of Technology, Purdue University, University of Notre Dame, Indiana-Purdue at Indianapolis, Indiana Wesleyan University, Butler University, Ball State University, Valparaiso University, Wabash College, and DePauw University among the many public and private institutions located in the state. ↑ National Park Service. Find A Park Retrieved November 24, 2007. ↑ Bill Holden. Canals in Indiana The Indiana Traveler. Retrieved December 21, 2007. ↑ Duke Energy. Location & Transportation Retrieved December 21, 2007. Writers' Program (Ind.). 1941. Indiana, a guide to the Hoosier state. American guide series. New York: Oxford University Press. Population Density of U.S. States. World Atlas. Retrieved November 21, 2007. Population Census. Population for Northwest Indiana Region. Retrieved November 21, 2007. Population and Population Centers by State in 2000. State Centers Census. Retrieved November 21, 2007. Census 2000 Summary File. U.S. Census Bureau. Retrieved November 21, 2007. Population Census of Cities and Town in U.S.. Census.Gov. Retrieved November 21, 2007. Personal Income by Major Source and Earnings by NAICS Industry. Bureau of Economic Analysis. Retrieved November 21, 2007. Student Exchange Census for 2005-2006 School Year. Institute of International Education. Retrieved November 21, 2007. United States Geological Survey. Indiana. Angel Mounds State Historic Site.